Beatrice Spurgeon’s face lit up with joy as she showed family pictures to Sister Margaret Banar on Dec. 22 at the St. Augustine Home for the Aged in Indianapolis. The 94-year-old resident moved to the St. Augustine Home in 2003 and enjoys visiting with the Little Sisters of the Poor, who are now part of her extended family. The residents, happy family atmosphere and daily Mass at the home are among the reasons that Sister Margaret loves her ministry as a member of the international women’s religious order dedicated to serving the elderly poor. She said the residents, staff members, volunteers, benefactors, friends and relatives of the residents all contribute to the family atmosphere at the home. 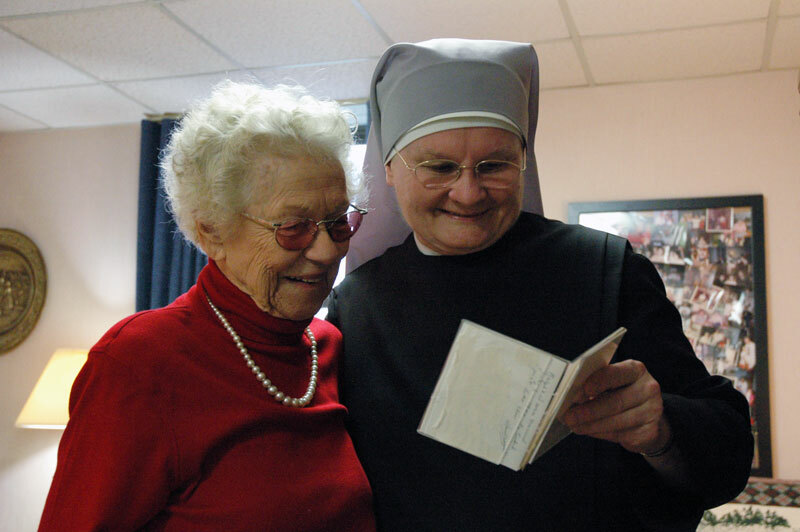 Sister Margaret completed coursework as a licensed practical nurse, earned a bachelor’s degree in special studies in health care, and is licensed as a nursing home administrator in Indiana and several other states. She served as the superior of the Little Sisters home in Pittsburgh for nine years during the 1990s. In Indianapolis, she helps Sister Judith Meredith, the superior, with a variety of responsibilities at the 40-year-old home located at 2345 W. 86th St. The sisters currently serve 95 elderly residents who live in apartments, assisted living or the infirmary at the immaculately kept home. She visits Indianapolis-area distribution warehouses, businesses and trucking companies to ask them to support the Little Sisters’ ministry by donating food, money and other supplies. She also discusses the sisters’ mission during Mass appeals at parishes in the Archdiocese of Indianapolis and Diocese of Lafayette. The congregation was founded by Blessed Jeanne Jugan in 1839 in St. Servan, France. The Little Sisters operate 32 homes in the U.S. and 205 homes in 31 countries throughout the world. Every few years, each sister receives a new assignment, she said, and she has gotten to know sisters and residents at many homes throughout the U.S. When Hurricane Katrina decimated the Gulf Coast in August 2005, the mother provincial in Baltimore asked her and several sisters from other homes to help care for displaced residents of their New Orleans home who were evacuated to safe quarters at a nursing home in Baton Rouge, La., hours before the storm. She served in Louisiana for about three weeks. The Little Sisters have a great devotion to God, Jesus, Mary and St. Joseph, who is their patron saint and special intercessor for prayer requests. They trust that God will provide for the residents’ needs each day, and do not have endowments. A native of Detroit and the second oldest of five siblings, Sister Margaret felt called to religious life while attending the former Rosary High School and volunteering at the Little Sisters’ home there. She enjoyed helping the elderly. After graduating from high school, she joined the Little Sisters of the Poor more than 30 years ago and was a postulant then a novice for two years before deciding to discern her future. She worked at a hospital for a year as a licensed practical nurse before rejoining the order. A religious vocation is a calling from God, she said, but it is difficult for people to hear God’s call today because of all the noise and distractions of popular culture.